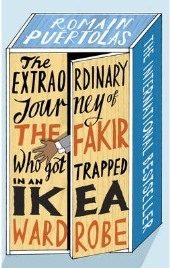 The Extraordinary Journey of The Fakir who got Trapped in an IKEA Wardrobe by Romain Puertolas is one of those books whose title makes it a little hard to ignore. It’s an interesting technique to intrigue the potential reader with a title that seems to almost tell the story itself and I’m reminded by such classics as Salmon Fishing in the Yemen or ‘A Short History of Tractors in Ukrainian’. Romain Puertolas is a French writer and this book has already been a hit in his home country. His translator – Sam Taylor – has done an amazing job to take such a bizarre book with its many complex puns and jokes, and translate it into something digestible by an English speaking readership. Knowing a little about the reliance of French humourists on bad puns and word play, I’m impressed that Taylor has captured the spirit of that humour without forcing it on us too much. This is the story of an Indian fakir called Ajatashatru Oghash Rathod who has been a fake all his life – in effect, a fake fakir. That’s the kind of clever stuff that impresses me about the translation. We meet him on a plane, flying to Paris on a ticket paid for by the villagers from his home who have financed his trip to buy a new bed of nails. On landing he hops in a taxi and says “IKEA”. It doesn’t really matter that the gypsy taxi driver who takes him rips him off by going to a store on the other side of Paris. It doesn’t matter because Ajatashatru is going to pay him with a fake €100 bill that’s only printed on one side, and he’s not going to let the driver keep it – after all, he needs it to buy his bed of nails. Once at IKEA, his plans go awry because the bed won’t be available until the next morning and it’s going to cost more than his fake €100 bill. He pulls a stunt on a nice lady in the restaurant queue, getting an extra €20, a free dinner and a new love interest all into the bargain. With nowhere to stay the night and no money for a taxi, IKEA is the obvious place to sleep right up to the point when some workmen come to dismantle a room display, and it just happens to be the one in which he’s climbed into the wardrobe to hide. So far, so utterly peculiar and that’s just the start. The wardrobe gets him to England and then deported to Spain where his attempts to stay alive see him climbing into a trunk and getting flown to Rome before he heads to Libya and back to France again. It’s a totally fantastical, unbelievable plot line but that’s not such a bad thing. There’s nothing wrong with a bit of a bizarre story line once in a while. Whilst I was reading I was imagining this as a film adaptation and putting a young Peter Sellers in the lead role of our hapless faking fakir – complete, of course, with a ludicrous accent. Perhaps these days I’d better give the role to a proper Indian actor – Amir Khan if I get to choose but then he’s my leading man of choice for any plot. The book is fun, it’s not to be taken too seriously, but it does deliver on some contemporary themes about the lot of immigrants. Whilst our fakir falls into and out of trouble without ever really experiencing true ‘peril’, people he meets are not so lucky and the six Sudanese he encounters in the back of a truck are a realistic representation of people desperate to look for a better life within the UK. I’m sure this book will offend anyone who’s from the travelling community as it’s pretty scathing about gypsies, painting them as a bunch of violent con-merchants with very funny names. In contrast, the author manages to be fairly pleasant about most other nationalities. The author worked as a police inspector with the French border agency and specialised in detecting document fraud. You might expect that with his background he’d have gone for something much darker and more serious, but I suppose that if you have the right frame of mind, you can find the humour in even the darkest of situations and the deepest depths of human despair. Don’t expect anything too deep but do expect a rollicking romp around Europe and North Africa, a likeable rogue who always falls on his feet, and a supporting cast of assorted mongrels. And surprisingly – given the ridiculousness of the overall plot – there’s actually a bit of a love story (or two) squeezed into this book for those who need the solace of a happy ending. One Comment on "The Extraordinary Journey of The Fakir Who Got Trapped in an IKEA Wardrobe"
Great review. I just put this book on my wish list!